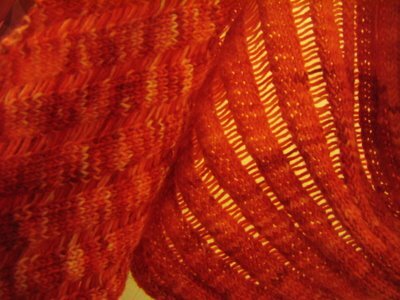 I finished the kool aid clapotis. There's not much I can say new about that. It's a wicked pattern. It was fun. It was addictive. It looks great. 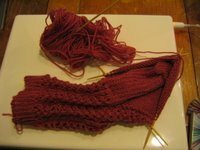 Knitting up, I could see how uneven the skiens I dyed were, but the clapotis can cope with a bit of striping, so it looks fine. I've started Hedera which is fantastic. It's not pomatomus but (a) what is, and (b) it's much easier. It has the same twisted rib for definition and stretchyness. All very yummy. I'm using dpns as I've set myself the challenge of a whole pair of socks without bringing out the magic loop. 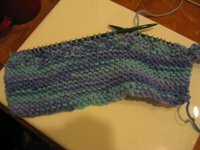 I've also started a baby cardi, haiku for a friend who's third is on the way in June. The yarn is some Red Heart a friend brought back from Florida for me because I was curious about what all the Amerincan blogs were bitching about. She's away travelling the world at the moment (last spotted, India) so won't be there for the baby's birth, I thought using her yarn would make it a gift from the two of us. 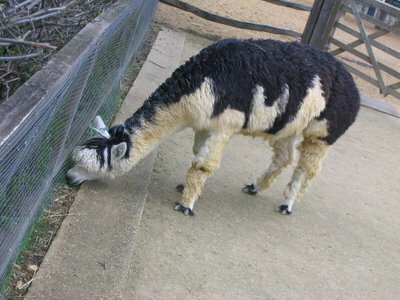 And because my boyfriend took me to the zoo and I met a cute alpaca, we have a shot of it too. 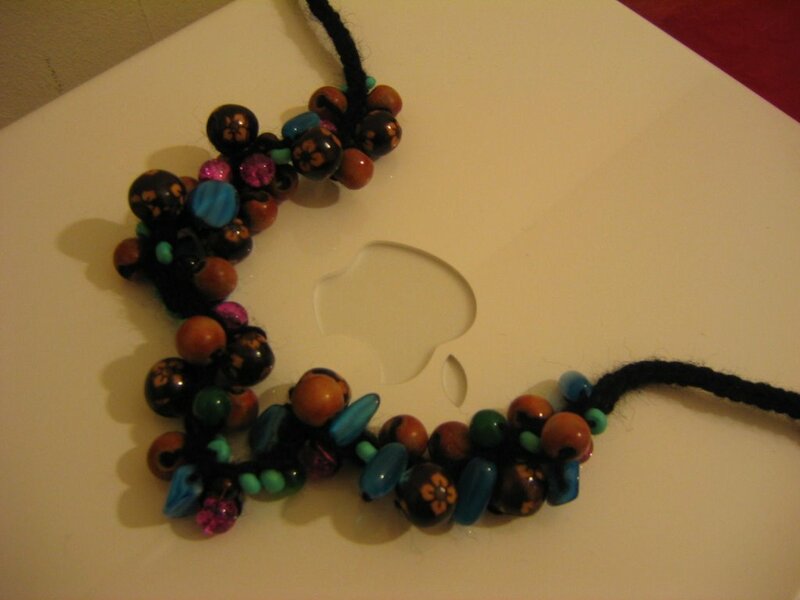 Beaded i-cord jewellery is great for using up bits of leftover yarn and can be made out of most anything. 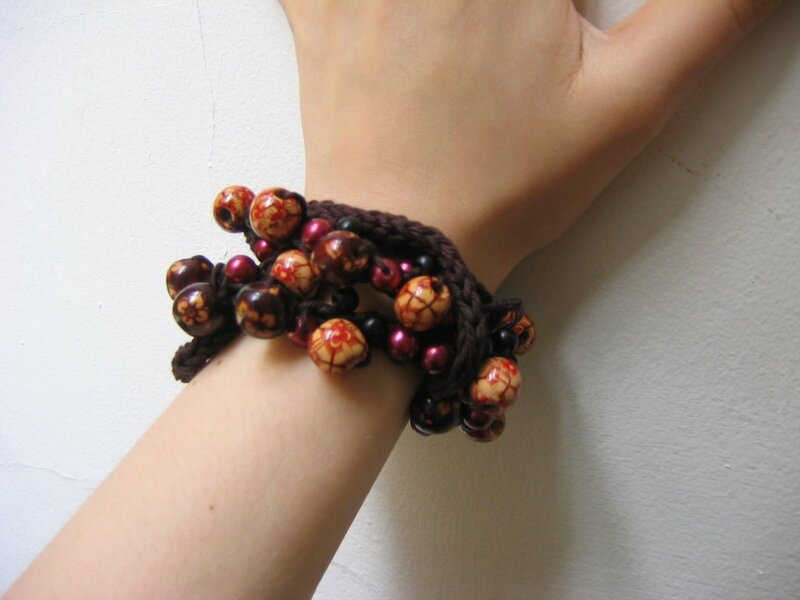 It works as braclet or necklace (depending on length), is really easy and knit up super-quick. They can look elegant or punkish, whatever you like, and the finished pieces tend to have a luxurious weight and density to them. Best of all they are fun to fiddle with. This isn't really a pattern, it a formula for producing the appearance of chaos, where you choose some of your own rules and never work an even set of repeats. This means many things - you produce a sublimely individual piece of art and it makes for an entertaining knit. Plus it doesn't matter one bit if you mess up. One of those ends of a ball of wool that are too big to through away but too small to do much with. You can use about any yarn. My personal favourite is darkly coloured 4ply mercanized cotton. I found i-cording Kild Silk Haze painful and wouldn't wish it on anyone. Two dpns suitable for the weight of yarn you have. I prefer a reasonably tight gage for elegance and strength, the beads loosen it anyway. You don't want it too tight though, or it can get fiddly. For example I use a 2.5mm or 2.75mm for 4ply cotton. Assorted beads with holes big enough for your yarn to go through. I recommend spherical beads because of the way the yarn wraps round them, but have used square and oval ones successfully. The quantity depends on the concentration of beads you want and how long a piece you want to work. 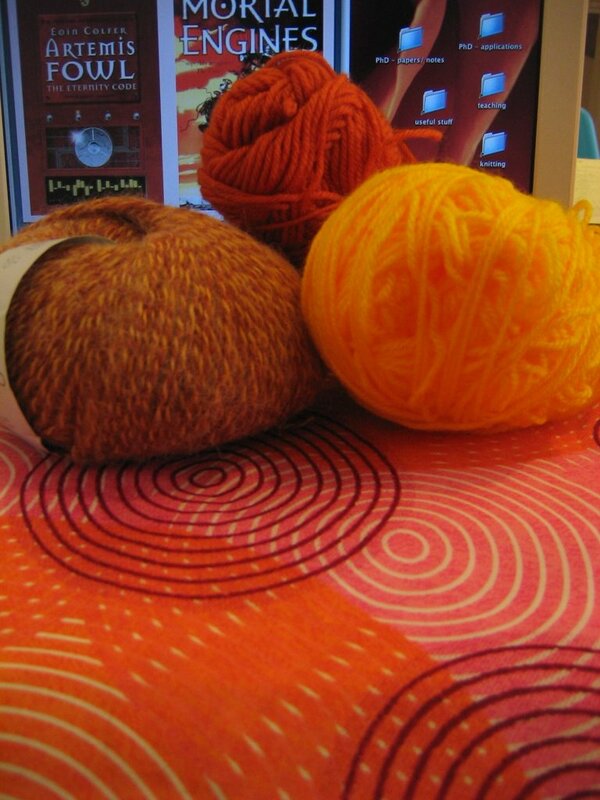 Choices over yarn and beads (quantity, type and weight of both) affect each other, so don't choose them seporately. For example, a bracelet made out of loads of really heavy beads might need to be done with something strong like cotton. First find your yarn, then choose your beads. I put them in a bowl and stir around a bit to check the mix looks nice together. Thread your beads onto the yarn. Remember the order you thread the beads onto the yarn will be the reverse order you work them. Make up some sort of pattern if it is meaningful to you or just do it randomly. Personally I like to make the appearance of chaos, but work to your own aesthetic. I find starting and ending with the smaller beads looks good, plus it's easier to work the smaller beads so probably a good idea to end with a few of them. Cast on three stitches and work in i-cord till it measures 12cm/ 5inches (enough so you can use these ends to fasten it together). Then start to work beads in. The tips below might be useful, but go with what feels right because it will depend on the beads, yarn and look you are going for. Work till you've run out of yarn/ patience/ beads. Make sure you finish with 12cm/ 5inches of plain non-beaded i-cord. How to i-cord - After casting on, knit your sts from one needle to the other. Then move these sts down the needle to the other side (i.e DO NOT TURN YOUR WORK) and knit them onto the first needle. Repeat this until desired length, remembering that you are always working the right side and not to turn your work. How work beads - Put the needle into the first stitch as if to knit, then bring a bead right up to the needles and knit the stitch to lock the bead into the knitting. 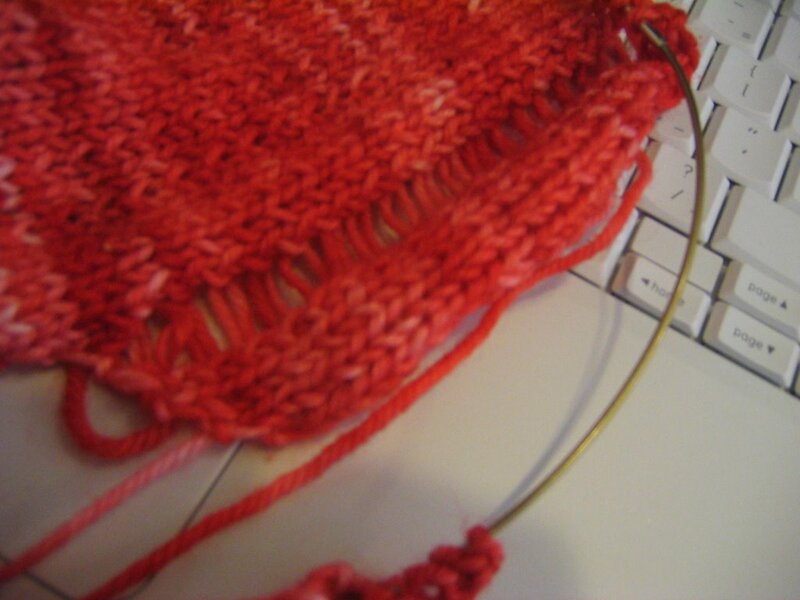 If working a bead into the middle stitch, do so with a purl. This is done in the same way as you bead a knit stitch. I sometimes purl side stitches too, depending on size of beads below. I tend only to add one or two beads in each row, and to do a row of plain knitting between beaded ones. It is sometimes easier to twist the stitches (i.e. 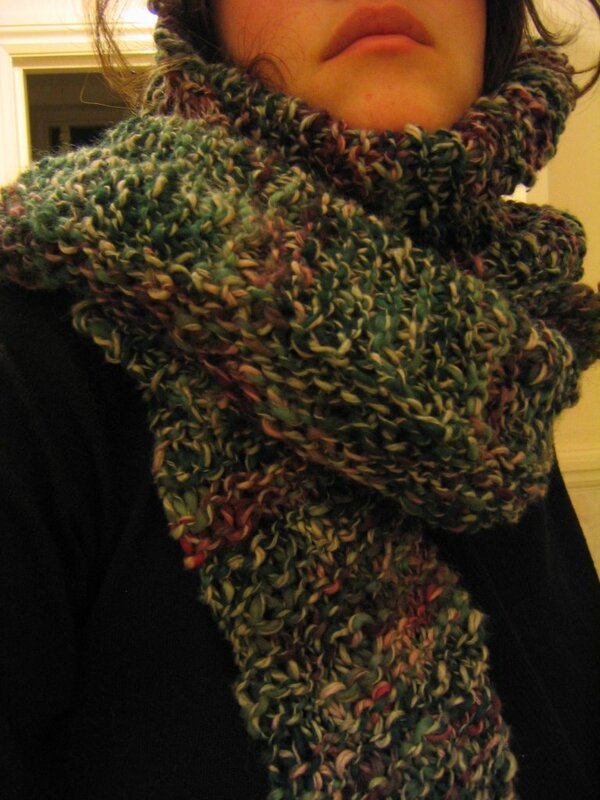 knit through back loop) if there was a bead in the row below, especailly if it has been purled. When finished wrap around your neck or wrist, fastening by knotting the i-cord ends (a safety pin will be more secure with some yarns though, plus it hits punk aesthetic buttons). This photo is of some stuffed birds on display at the Horniman museum. 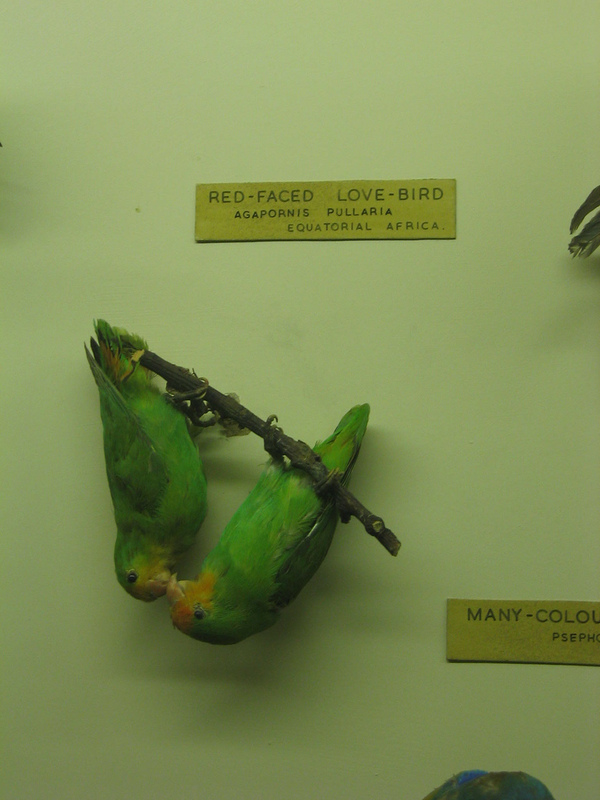 It has nothing to do with knitting, except that these birds are "red faced love birds" and I'm feeling a bit red faced. About the thing most knitters feel embarrassed about, my stash. But in a moment of productivity (or was it procrastination, I have a pile of marking sitting next to me...) I joined stashalong. Still, I'm not about to stand up and say "My name is Alice, and I have a yarn problem". Not because I'm in denial. Much. I've seen the flashes of stashes, I'm not that bad, but my box of yarn does bug me. Leftovers - balls, or rather almost-balls, leftover from projects or ideas that didn't work out. These are the most annoying. Gifts - I love the challenge of getting yarn from someone and having to work out what to do with it, but they do sit in your stash till inspiration hits. Jumpers - I blame cucumberpatch and their great deals. 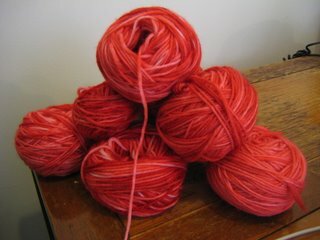 Plus, I frogged the first jumper I ever made, so have a jumper's worth of red matchmaker dk too. There is also a fair amount of sockyarn, but that doesn't count. Well, not so much. Ahem. It's only five actual pairs of "unassembled socks", with maybe a pair or two's worth of leftovers which could be turned into stripy socks. I've signed up for three whole months of no yarn buying. Which includes no sock yarn. I'm allowed a day off a month, but that's way more than I need (as I said, I don't really have a "yarn problem"). I might buy some boy-coloured sock yarn for a few gift celebrations I have this term (e.g. father's day). But that's it. Ideas include blankets and toys for odd bits, plus learning to crochet. First step includes clearing some of my bead stash too, so I'll post a beaded icord tutorial sunday/ monday when I've sorted my camera. Yeo Valley do wool. Yes really, they of the yoghurt. It's organic. And not badly priced. I've finished the beaded icord bracelet for my boyfriend's mother. The pattern isn't much more than the title - you bead icord. But I'll maybe paste up more detailed notes on it next week. I've done a few of these and there are some tricks I've worked out that are worth passing on. 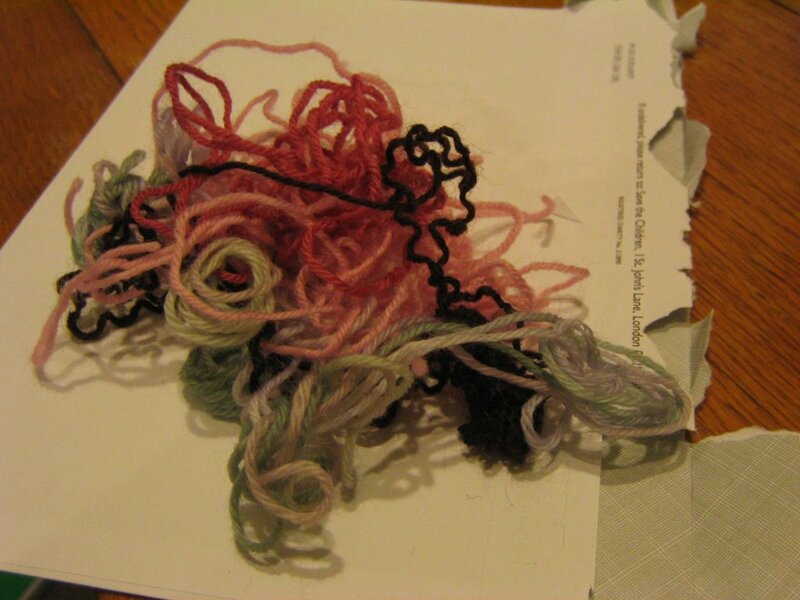 So I had this great idea of a "decomposing lace" scarf. Small patches of detailed lace randomly running in and out of a basic stocking stitch base. I'd take a load of virgin merino and dye the poop out of it with kool aid. It'd be georgous, they're be some 70s style environmental comment in there somewhere (trust me, I'm working to be a Dr on this) and I'd submit it to the college art competition. I dyed the yarn. I had fun. It turned out yummy. 1) The yarn was more verigated than I planned. This is in many ways a good thing. But too verigated for this rather mixed texture design. I don't really like complex stitch patterns with complex colour mixes. 2) The image of the design I had in my head lost something in the translation to pattern. Looking at it knitted up, I realised the mental image actually used two different weights of yarn, the lace a detailed 4ply, the rest of it a garter/ stocking stitch cloud of aran. So I gave up the decomposing lace idea (for now - I may return once I've learnt to crochet, probably in plain white or cream). Instead I thought I'd make my very own exchequered. I thought I could work the MC and CC both as this kool aid yarn, because the slight stripes would been gently broken up by the swap at each box. It'd be a lot more subtle than the black and yellow, but that should be a good thing. However... turns out? The yarn? For this idea? Isn't verigated ENOUGH. Plus double knit with the same colours is a pain in the bottom. Frogged again. So a load of dk weight verigated yarn? 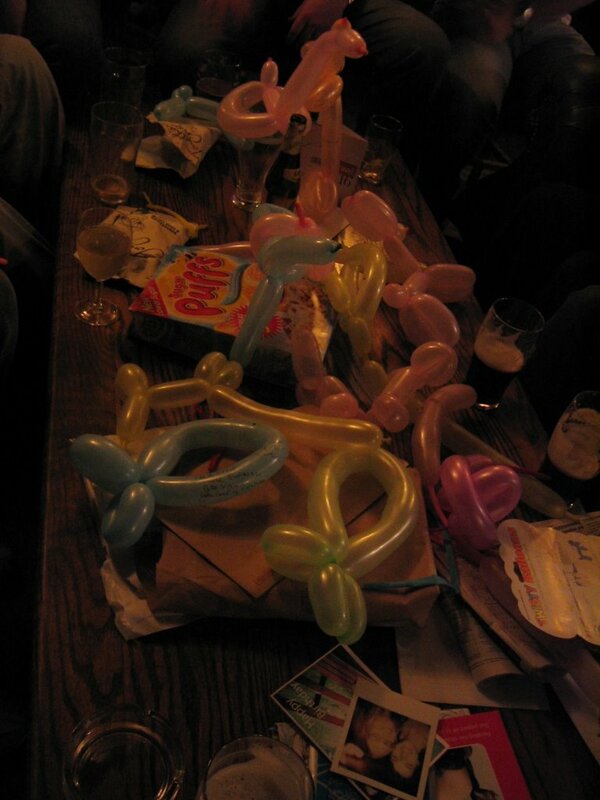 This photo's from my birthday celebrations last tuesday, at the "Princess Alice" pub near Spittlefields. I have a new fridge magnet. And a giant bar of chocolate. And beads. And I just had one of the loviest Secret Pals ever. She noticed on the questionnaire that my birthday was just after the end of SP7 and sent me a bonus birthday package. I was sorting to send her a thank you anyway, and it'll be in the post as soon as Royal Mail starts up again (its closed until tuesday, for Easter). I also have a huge pile of kool aid dyed yarn to ball* and a very very messy kitchen. So I'm going to turn off the computer now. Marcus bought me a book of muffin recipes, so there may be baking before the day is out. * I've balled one skein so far and (when not swooning from the smell of cherry kool aid, I can't belive people drink this stuff) been playing with swatches. 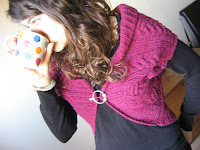 I have this idea of a garter stitch based wrap that runs in and out of lace patches, a little like exchequered does, but with a totally different look. I'm ever so slightly ashamed to say it was inspired by a Harvey Nick's window display. But I can't find a garter-stitch lace pattern I like. I'll play. Something will work itself up. I spent most of today dying yarn with various cherry colours of kool aid for the art project. It's still drying, I'll post pictures when its ready to be knitted up, or at least dry enough to photograph nicely. So the picture's from New Year, but it fits as it's my birthday today. Hence the day off playing with kool aid. We had cake last night. Chocolate and cherry cake. Can/ jar of spitted cherries, drained. Preheat to Gas Mark 4/ 180 degrees C.
Melt chocolate slowly in a waterbath (or in heavy bottomed pan or microwave, but be careful, in a bowl inside a pan of hot water is the safest, you don't want to overheat it). Cream sugar and butter, beat in eggs. Add spoonful of flour, spoonful of chocolate. Continue like this till all flour and chocolate used. Fold in cherries. Pour into pan and bake for about 20 mins. Leave to cool for a few moments before eating. You'd be surprised how nice these are cold, as Kirsty and I discovered this morning. 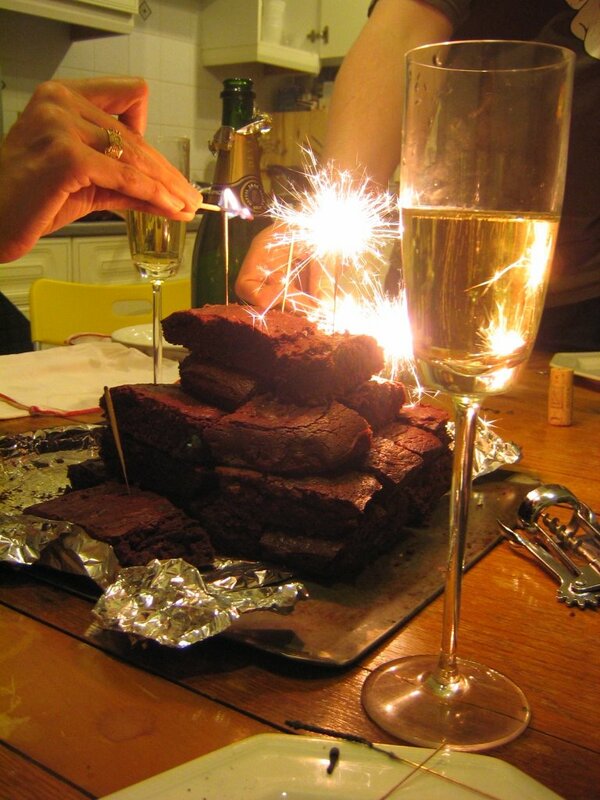 Enjoy brownies responsibly as part of a varied diet. My lovely model - Uslan. He's single. Straight. Smart. And been known to make his own clothes. Doesn't knit, but dare say he could learn. Easily bribed with beer and brownies. I warn you, the dude has a filthy mouth and terrible taste in football. There is a book called My Life in Orange. It's about a childhood living in a cult. My life in Orange wasn't quite that, but the book did come out about the same time my uniform for work went orange and I always feel and affinity with it, albeit a tenuous one. I left that job about a year later, but still spent too much of my life in orange, which is why I still tend to think of it as an icky colour. However, thinking about the oranges in my life for Project Spectrum has reminded me of the beauty of that colour. 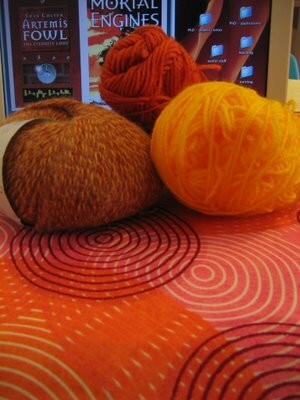 In the photo: one ball of luxury tweed that will become a CC in an argyle tank top (see link in sidebar); some yellow acrylic and orange merino (both half balls, leftovers). The fabric is some cool stuff a friend gave me for xmas, you can iron it into shape to make bowls, etc. On the screen in the powerpoint for the paper I'm giving this weekend. EDIT: the job? It was working as an Explainer at the Science Museum. 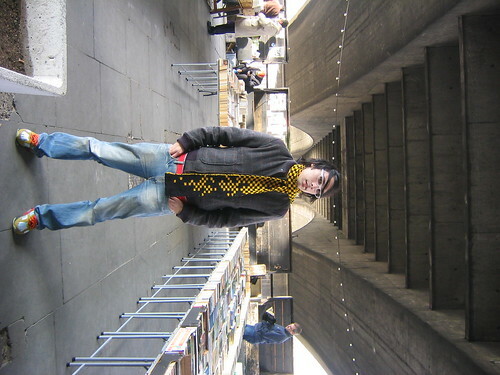 When I left I realised I'd been there a quarter of my life. It wasn't like living in a cult, but the place can institutionalise you somewhat. I have a slight aversion to green for the same reason. My flatmate has this theory that there are few things in the world that can't be inproved by throwing in a cable. 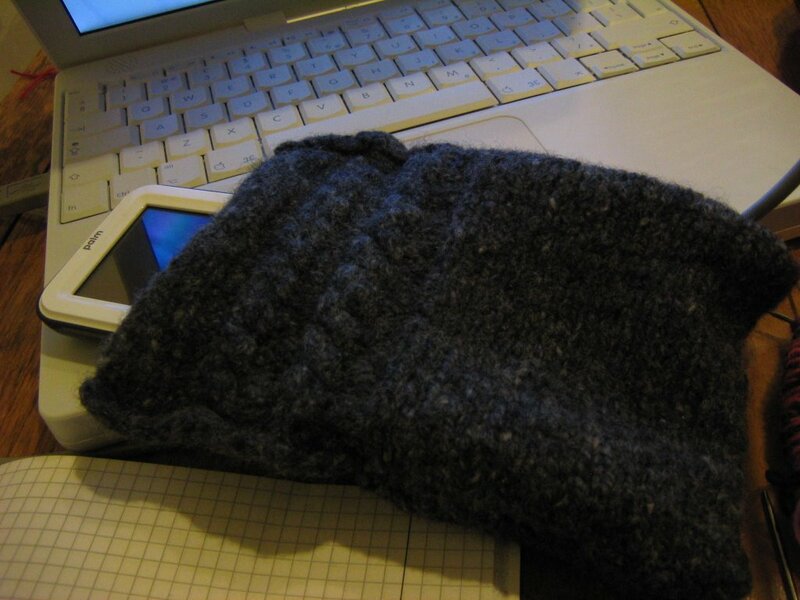 I was using a leftover half ball of tweed to do a felted case for my new electronic diary and I thought test this out. Its inspired in part by Alterknits - Radford suggests felting old jumpers into bags and some of the ones in the photo looked cabled. I wasn't sure how it'd work out, this was really just a test run, but I like it. 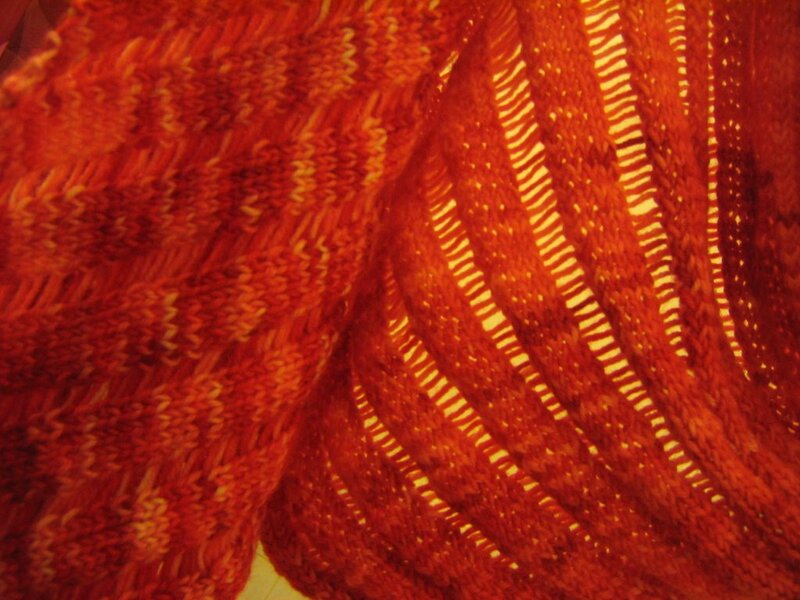 You loose the definition in the felting but that's part of the beauty - I like to think of it as a "sunken cable". Next time I'll try with with wool that gives a better stitch definition and work a more complex cable. All I have to decide now is weather felted cabled socks would be (a) be too thick and (b) involve too-painful maths. My "chocolate socks" idea is not going as planned. And the versions I've rejected have been sitting at the bottom of my knitting bag looking poo and taking up yarn I'd rather knit with. So on my bus home this eve I unravelled and reballed. Have you any idea how annoying it is to frog fair isle? Also, while feeling rant-like I'd like to complain about my inability to buy 2mm dpns today. None at John Lewis, Liberties had some, but only 20cm long ones, I might as well magic-loop. I'm going to my room to hide with a Buffy DVD and bead icord - see link to example in sidebar. I have some mini FO's to show, but they are washing/ blocking so I might leave posting about them till I'm back from Newcastle (another conference this weekend). It was getting all quite spring-like last week, but its grey and cold again. Still, the moments of sun seem to have prompted a few buds. 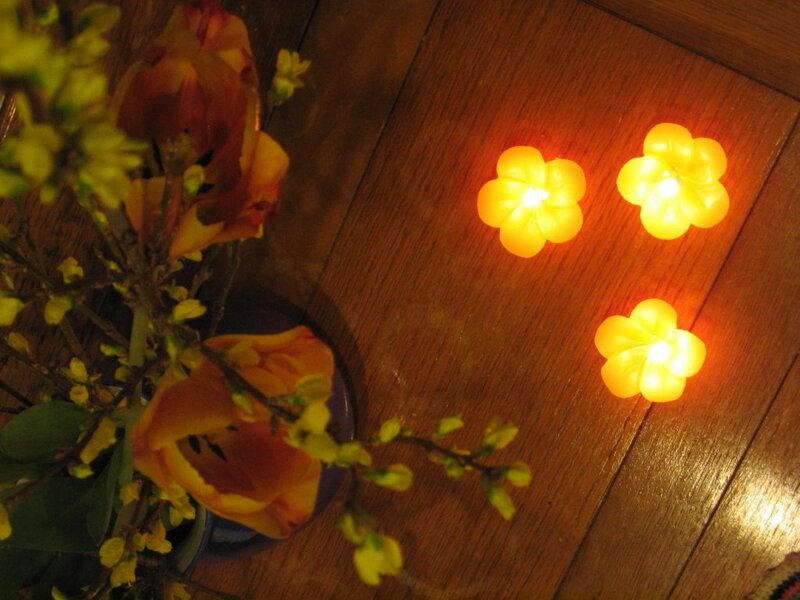 To celebrate this odd freezing cold spring I give you Project Spectrum glowing candles, complete with orange-yellow flower arrangment my flatmate did over the weekend. The candles are from my SP (the pic I was holding out from my last post) and just sum up our mix of blossom and night frosts - flowers, but they give out much needed heat. 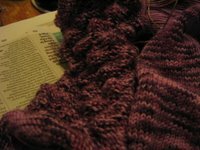 I've very nearly finished a pair of socks with some of the purple sockyarn my Secret Pal sent me. I was going to do Falling Leaves, but with a figure8 toe. But as I was about half way into the toe I realised the 72sts round it called for would be way too big. 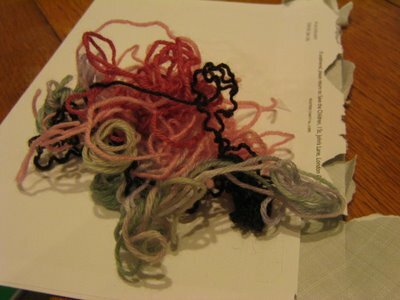 This is the beauty of figure8, its like a toe and gage swatch in one. So I thought about Elfine socks, which is about 65sts. Still too big, I stopped at 60sts and found my own lace pattern that worked over multiples of 10sts. Its basically the same idea as Elfine and Falling Leaves, just a different lace pattern. Something similar, nothing to complex, just break up the verigation stripes and give it a bit of texture without looking crazy. I think I'll call them them "Purple Peaks" because of the mountains the pattern makes pre-blocking. So I have an FO! I finally completed the giant green garterstitch monster (using Collinette Prism, on 6mms). It is HUGE and lovely and warm. Do I sign up for this? Or this? Or neither? Mmmmm.